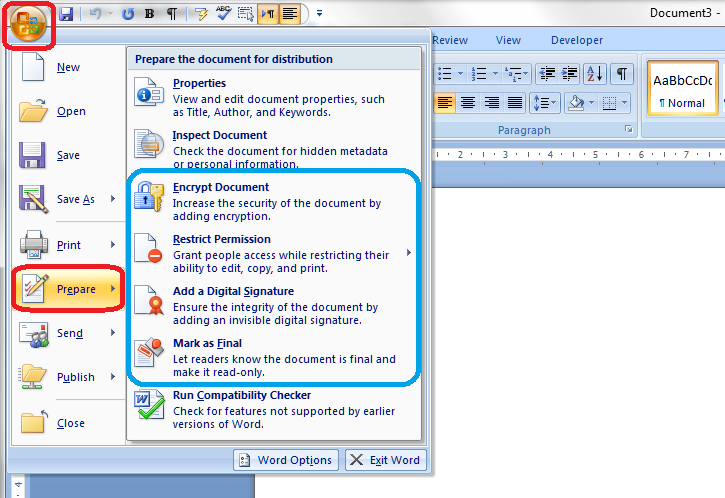 As part of my series on protecting your document, which has looked at Applying Watermarks and Protecting Word 2010 Documents, today we’re going to look at the features for protecting your document offered by Word 2007. Why would I want to protect a document? 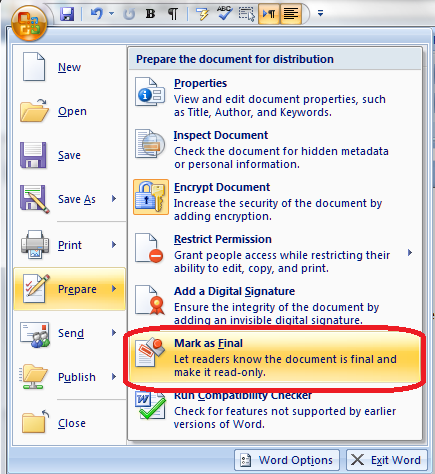 Where is the menu for protecting documents in Word 2007? How do I add a password to a Word 2007 document? The most simple way to protect a document is to add password protection. This means that no one without the password can open it (so if you email it to someone, it can’t be intercepted and opened, or people who aren’t meant to see confidential information can’t open a confidential document). You will then be asked to enter a password (twice). Do remember this, and remember to share it with anyone else who might be permitted to open and read it. How do I make a Word 2007 document read-only? Another way to protect your document from unwanted edits is to make it read-only. Of course, anyone can “save as” the document and make all the changes they want, but your original document, with its file name, is protected, and often people don’t realise that they can save as, anyway. Now, when someone opens this document, they will be told that it is read-only and they cannot edit it. How do I restrict editing in a Word 2007 document? 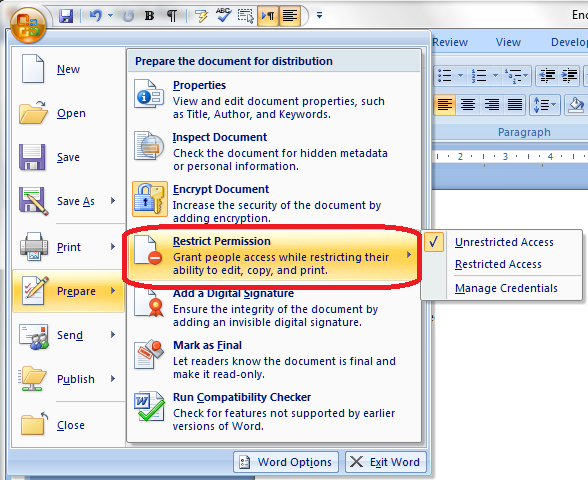 Another option is to restrict certain types of editing in your document. You are given a dialogue box with lots of different options. Note that you can allow the AutoFormat to override the formatting restrictions if you want to. But this is where you can choose what can be amended and what cannot be amended. This is particularly useful if you want to ensure that the Headings Styles that you’ve carefully set up will stay the same in the document. 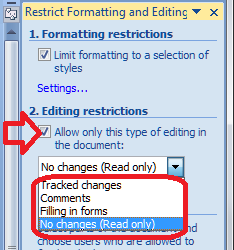 Editing restrictions allow you to choose whether the document becomes Read only or will allow tracked changed editing only or adding comments or filling in forms. Some of my clients make the documents that they send me tracked changes only so they can see exactly what I change in their documents. It’s a good way to remind people to keep Track Changes on if you’re working together collaboratively. Filling in forms is useful if you want people to fill in your form but not change the actual form. 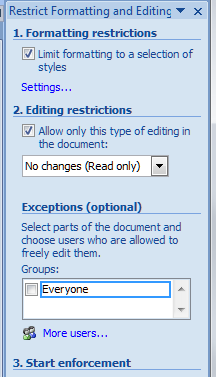 These permissions can be restricted to individual editors; however, see the next section for details on this option, as it needs to run alongside other network options that you may or may not be using..
How do I add individual editing permissions to a Word 2007 document? 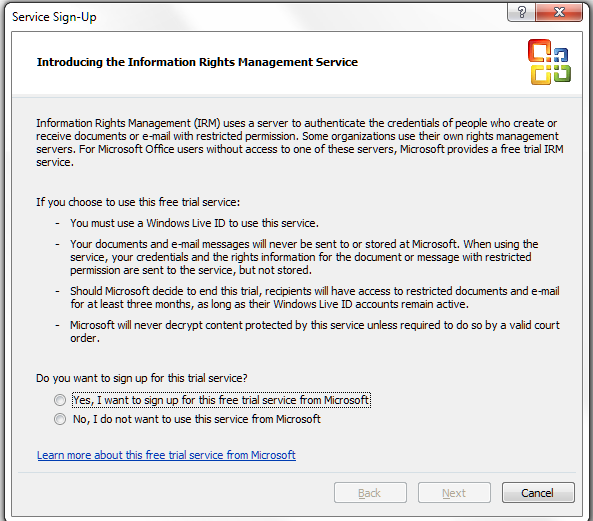 Most larger organisations have rights management systems that inform their procedures and file/drive setups, and these will usually allow you to set permissions and protect your document in that way. As this is outside the scope of this article: you will need to talk to your administrator or IT support department. But this option is here for you to use, and can be done if you have the relevant signups. Be careful: Contact IT or your systems administrator before signing up for something that can affect access to documents on a shared organisational system. 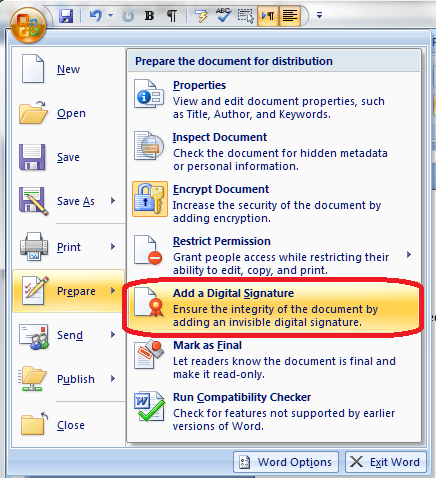 How do I add a digital signature to a Word 2007 document? Alternatively, you can sign up to a third-party digital signature service which will apply your digital signature to documents via an uploading and downloading service. How do I print to PDF using Word 2007? Making a Word document into a PDF is still the best way to protect it. A PDF is like an image of the document that can’t be edited, a bit like a photocopy or a picture taken of it. 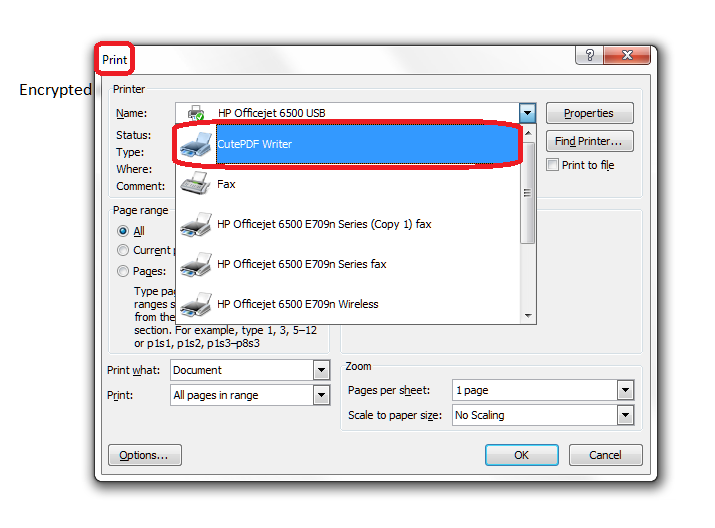 Unlike with Word 2010, you can’t actually print direct to PDF using Word 2007. 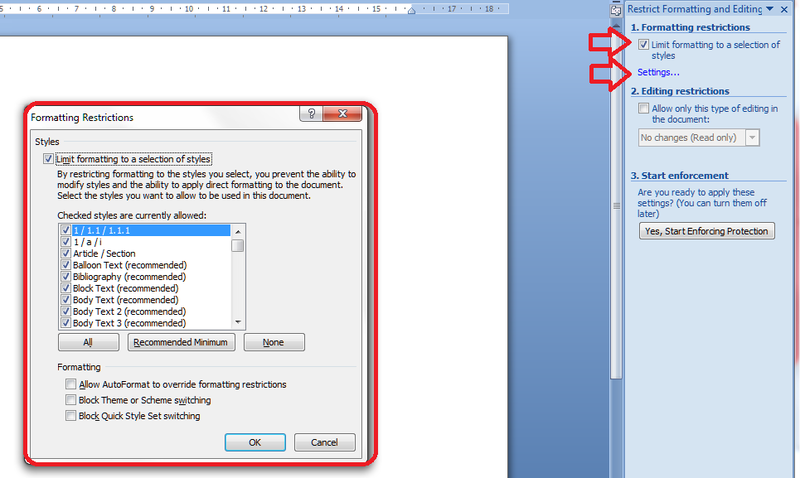 If you want to turn Word 2007 document into PDFs, you will need to download a PDF printer such as Adobe or CutePDF Writer. 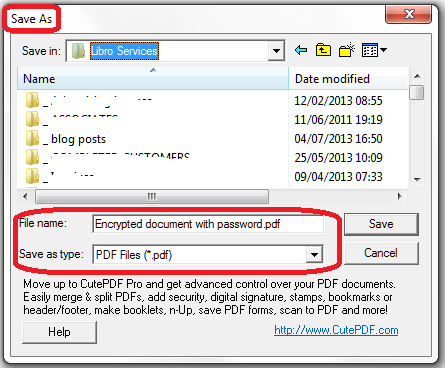 Note that, as in the above picture, you can password protect your PDF at this stage. This is a good idea, as software is now available that will let people edit PDFs, something that was not previously easy to do. We’ll talk more about using PDFs to protect your document in the next article. 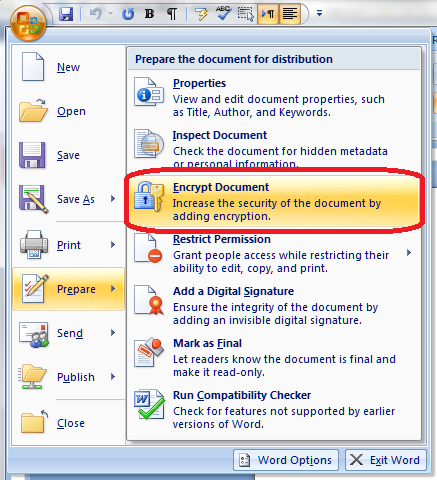 In this article, we’ve learnt how to use the features of Word 2007 to protect your document, using passwords, read-only status, editing restrictions, permissions and digital signatures. Thank you for your comment. If you can give me more information on the problem you are having, I can try to help. It may be that if you are working on a shared system, for example in an office or academic institution, you have not been given the rights to change particular aspects of Word documents. I have a docuemnt that will be used by another to edit and change some of the wording. I have put a watermark on ‘Not for distribution’ but want to protect the watermark from being removed without protecting the document fro changes. Can it be done, any ideas. Thanks for your question! It depends on what changes you want to allow. If it’s just wording/editing, you should be able to block changes to styles but not block all changes (look at the section in this post on Restrict Editing). Hope that helps – let me know if it works or if you need to do any extra steps, and I’ll include them in the post. Thank you for your prompt reply. I have just found out they want to make a new document based on the old one. This could mean all sorts of changes so the only thing i would like to protect is the watermark. I am assuming this will not be possible. Oh, that’s tricky. You could create a tempate that includes the watermark; that might work. Are you worried that they won’t know how to apply the watermark to the new document? I hope you sort out this tricky issue! Sorry i cannot create a new template as they want to ‘doctor’ the one i send. (Our templates are not to be changed by anyone except Q.A.) I do not want the ‘doctored’ document to be used without it being authorized first. This means they need to do whatever they need, change words or formatting to the document and send back to me for it to be signed and the document number to be added to our mainframe. This is why i wanted to stop the watermark from being removed. i hoped then that the inspectors would pick up on the Engineers if they tried using the document without authorization first. I think it is an impossible task. It’s difficult when it’s a procedural rather than software issue. The only thing I can suggest is instructing them to “save as” so that the background watermark is still on the new document. Good luck! I can say that till i am blue in the face but if they wanted to they would. Engineers are a nightmare. Thank you for looking into it and your help, you have given me food for thought. I am creating documents or forms within my organization to be used by a particular department. As I do this, especially when developing a template, I will password protect it from unintentional editing. But there are also situations where I don’t want to assign a password to the protection so I skip that task. 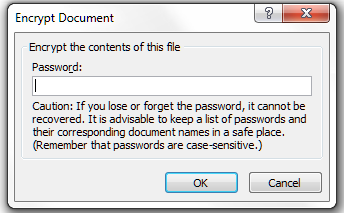 Only later when I return to that document and attempt to “unprotect” it I find that is “password” protected. How does this happen when I am the creator and I know I did not assign a password? Interesting question. What happens when you just leave the password blank and try to carry on to edit? Does it “assign” a password that is actually no password at all, but it just needs to include that screen?